"Mogu men! 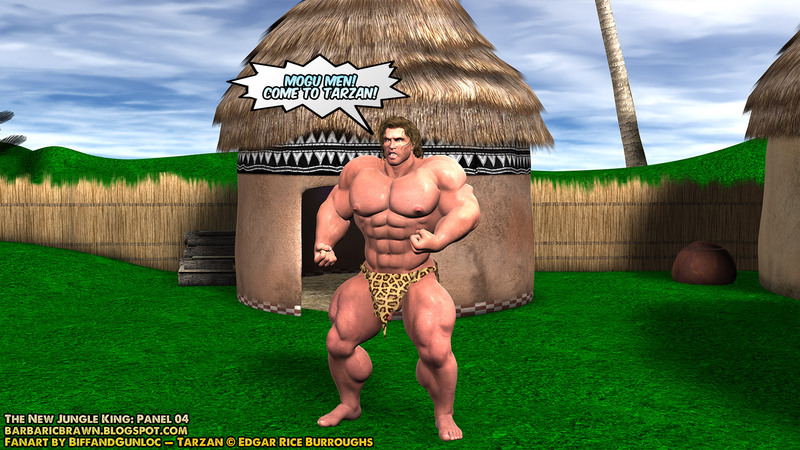 Come to Tarzan!" the jungle king shouted, knowing that the three were inside. A cursory inspection revealed to him that none of the other Mogu tribesmen were around. He assumed that they must be out gathering supplies before nightfall. The muscular white man clad only in a leopard skin loincloth watched as Kondo, Njau, and Zuberi emerged from the largest hut in the settlement. He could see the man in the red strap pouch was holding the jewel! Tarzan's worry had grown considerably, yet he managed to hide it well. His scowling face instead cast fear into the three young Mogu tribesmen.